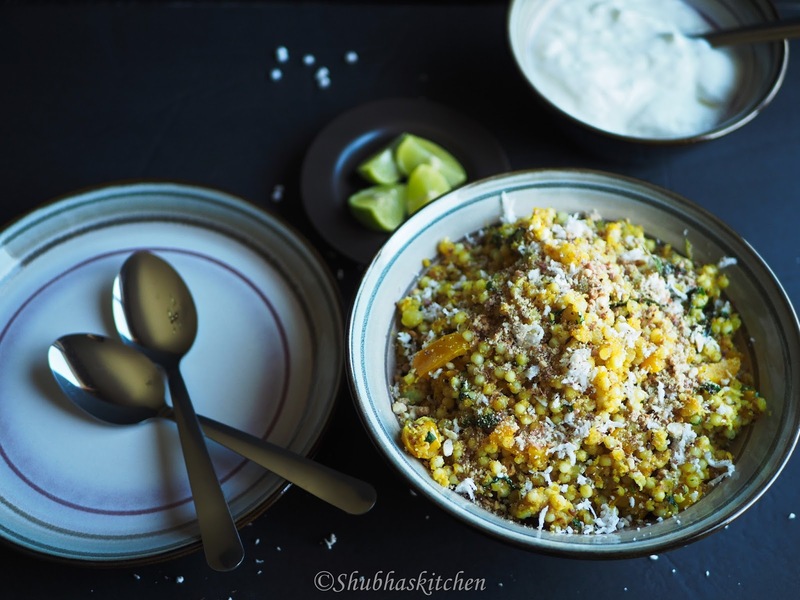 Sabudana Khichdi is one of the most popular dishes belonging to Maharashtrian cuisine. A simple , yet so fulfilling dish , it can be had with tea or pair it with yogurt to have as a meal:) I have made a very simple change to this popular dish by adding some bell peppers. The flavor of the bell peppers compliments this dish really well. 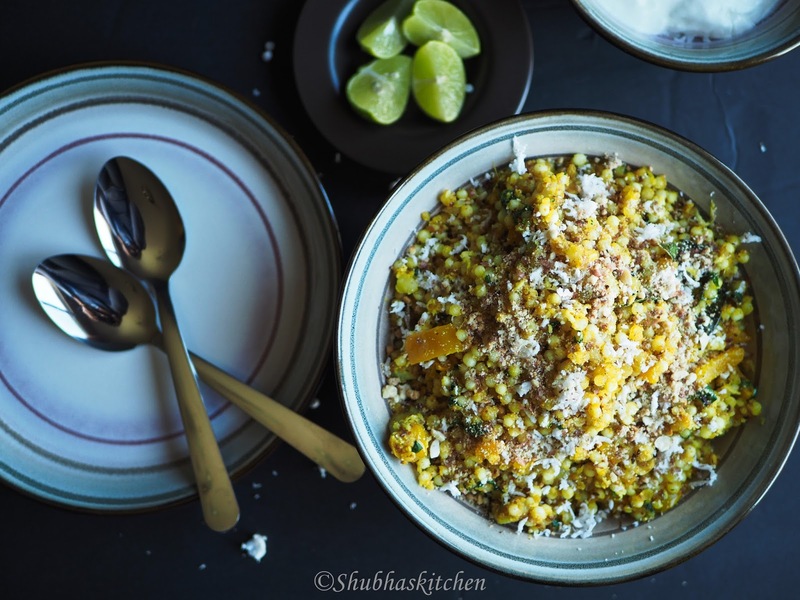 Personally, I love to load this khichdi with loads of roasted peanut powder , shredded coconut and cilantro. The sweetness from the peanut powder marries well with the spice of the red chili powder and tang of lemon juice. I have used a combination of oil and ghee in this recipe (3 tbsp oil and 1 tbsp of ghee) but you can choose to make it entirely with ghee (4 tbsp in that case). 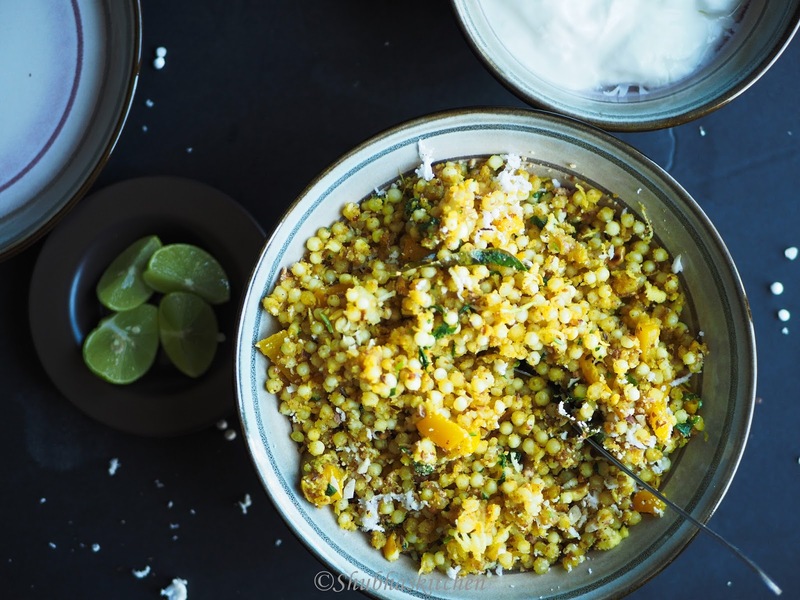 If you want to keep the recipe vegan, then skip ghee and use 4 tbsp oil in all. This recipe is gluten free too. Ghee : 1 tbsp (If you want to keep the recipe vegan, just stick with oil). Wash sabudana and soak them in water for 3-4 hours or until all the water gets absorbed (the level of the water for soaking should be just above the level of sabudana). Add the roasted peanut powder, red chili powder, turmeric powder, sugar, salt and lemon juice to the sabudana. Mix well. Heat Oil +ghee in a thick bottomed pan. When hot, add the cumin seeds. When the seeds start to splutter, add the curry leaves. Add ginger. Mix. Later, add the potato and bell pepper. Cover and cook. Once the potato is cooked, add the sabudana mixture. Mix well . Keep cooking till the sabudana looses it's opaqueness . Add the shredded coconut and cilantro leaves. Mix well. Serve hot. 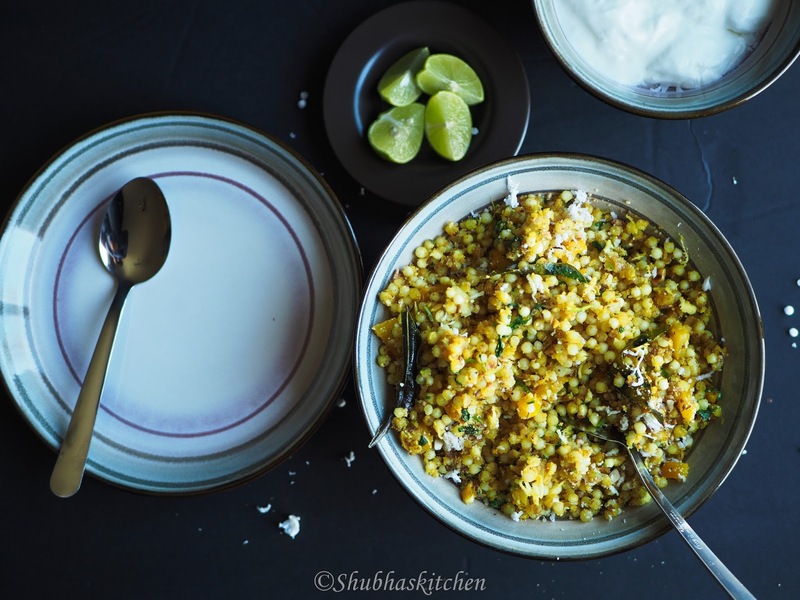 I love eating this khichdi with some fresh yogurt. Interesting dish with sago. For us, sago is usually for a sweet treat. I am impressed. 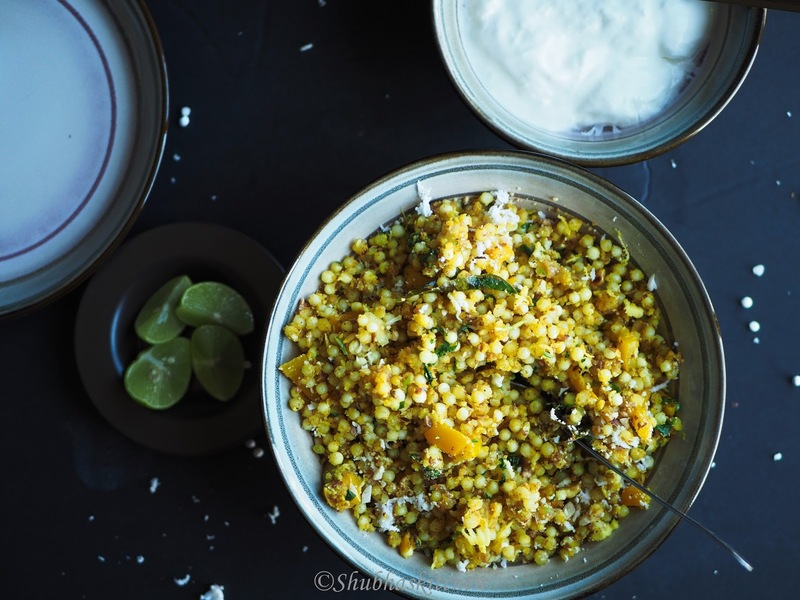 I would sincerely love khichdi alongside yogurt. That sounds really wonderful, Shubha. I've never had khichdi with tapioca pearls before. The texture must be quite different.